The Commit failback operation finalizes failback from the VM replica to the original VM. Open the Home view, in the inventory pane select Replicas. In the working area, select the necessary replica and click Commit Failback on the ribbon. In the displayed window, click Yes to confirm the operation. Open the Home view, in the inventory pane select Replicas. In the working area, right-click the necessary replica and select Commit Failback. In the displayed window, click Yes to confirm the operation. 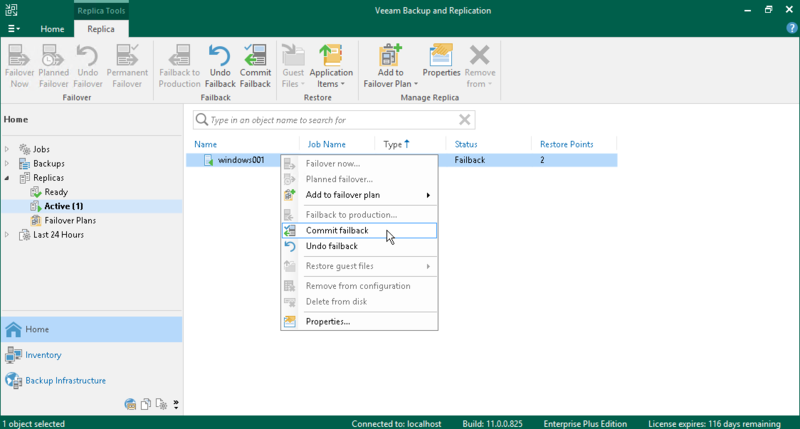 If the VM replica is failed back to a new location, Veeam Backup & Replication additionally reconfigures the replication job and adds the former original VM to the list of exclusions. The VM restored in the new location takes the role of the original VM, and is included into the replication job instead of the excluded VM. When the replication job starts, Veeam Backup & Replication will exclude the former original VM from processing, and will replicate the newly restored VM instead. If the VM replica is failed back to the original location, the replication job is not reconfigured. When the replication job starts, Veeam Backup & Replication will process the original VM in the normal mode.